Productivity and simplicity, these are two things the modern knowledge worker craves. Google Reader is my "secret weapon" of productivity and I'd like to show you how I get the most out of this program. Begin with the end in mind by knowing where you want to share. Facebook? Your blog? Twitter? Pinterest? I have a list of my places where I share every day including: my blog here, my tumblr blog, Facebook fanpage, Twitter, Google+, Pinterest, LinkedIn. c) Enable the services that you want to share to. Blogger, Delicious, Digg, Facebook, FriendFeed, Instapaper, Myspace, Orkut, Ping.fm, Posterous, Reddit, Stumbleupon, Tumblr, Twitter are all available. Just make sure you add Google reader on your pop up blocker's list of approved sites. d) Add information to add other sites. 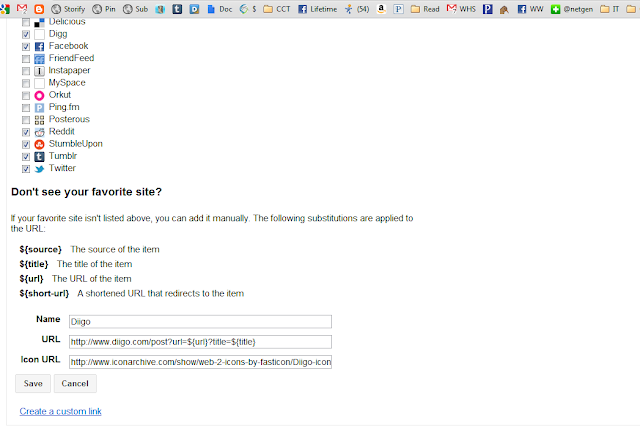 I use Diigo and need it to be integrated into Google Reader. I found some older directions from the "Jeff is a geek" blog and they work. Under name, I put Diigo. If this then that is a website that helps you automate things. 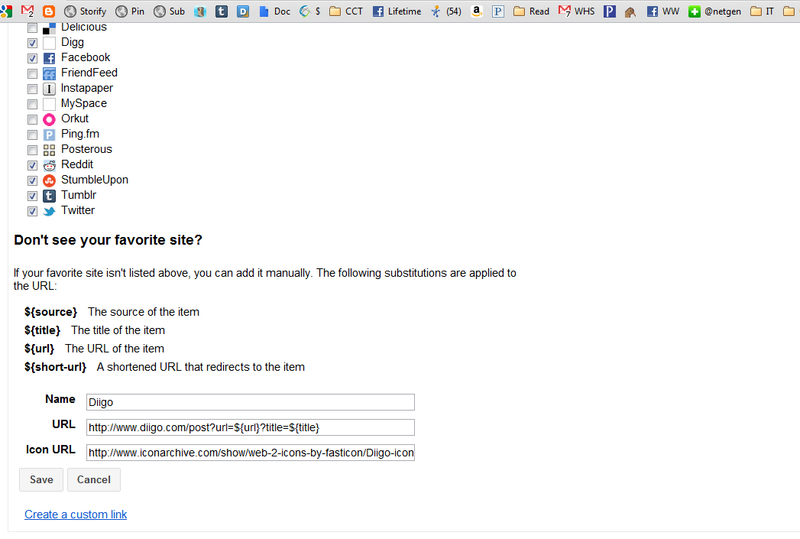 You can set up many different "triggers" from Google reader that are very simple. For example, some of the most popular recipes as shown in the chart, make use of the star in Google Reader by sending things that are starred to Buffer or Evernote or Instapaper or Delicious or Pocket. I choose to use tags to do this, although admittedly, I"ve realized I'm not entirely happy with that. So, something tagged tumblr sends to tumblr. The problem is that when it goes to tumblr - the words and tags are there, but I don't necessarily want the tag to say "tumblr." I haven't decided what to do about that, but overall, it is very useful. For example, I"m finishing up Collaborative Writing in the Cloud and as I've found things relating to the book, everything I tag wiki_book goes automatically to my notebook on the topic in evernote so it is all there when I head to research. I found Mr. Reader because I had a list of required places it had to share. At the time, it was the only one that shared to Diigo. It shares to everything and I read my Mr. Reader at least two hours a week as I share and write blog posts. Google Reader is so powerful because it can power great apps like Flipboard (see 15 Fantastic Ways to Use Flipboard). It is one of the keys behind my own ability to share and find things. It is an essential tool for researchers and I teach all of my ninth graders and tenth graders how to build their PLN in Google Reader by scraping news, blogs, and more using RSS. RSS is a powerful and essential tool with a name that intimidates smart people from even trying.